The secret is out - Amaro Montenegro is the bartender’s secret weapon; and they are finding a place for it in everything- from re-imagined classics to today's cocktail innovations. With versatile notes that have come together in perfect harmony since 1885 Amaro Montenegro fits perfectly into sours and dark and bitter stirred cocktails all over -- in fancy cocktail bars, hotel bars, and behind the bar of restaurants. Menus get an appealing refresh when Amaro Montenegro stands in for expected ingredients in classic recipes like the Manhattan, Negroni and other favorites. Proving, once again, that a spirit that’s been around since 1885 is not just the booze world’s version of Old Faithful, but also exceptionally nimble in giving the classics an edge and additional appeal. B-Team member Chris Lowder, one of Food & Wine Magazine’s 10 Mixologists To Watch 2015, is thrilled to see this happening all over. Having worked with Amaro Montenegro for a while now he understands just how flexible this amaro can be, but finds it even more exciting when he discovers that fellow bartenders, like Logan Ronkainen of Il Mulino Trattoria, are slipping it into drinks left and right in an effort to share their love for amaro with an enthusiastic drinking audience. Lowder spent some time talking with ShakeStir about his enthusiasm for Amaro Montenegro and the role it plays in modernizing the classics. SS: How do you see amaro, and specifically Amaro Montenegro, being used? CL: Amaro Montenegro is a great gateway into the world of amaro as it is so approachable and delicious. It’s a little floral and it is very complex and beautifully balanced. So, when someone sees that they are interested in exploring this category I think Amaro Montenegro is a good place to start. It’s showing up in a variety of environments. The brand has great versatility so there are all sorts of ways to use it and introduce people to it, and the category. I definitely would say that any restaurant should have it as part of their offering. Any place that is food focused is a perfect fit; these liquors and bitters are intended to make you digest your food. It helps you digest and it helps you be hungry and it is perfect on the rocks with a twist, or neat, before a meal and after a meal. It truly is a necessary step in a complete dining experience. 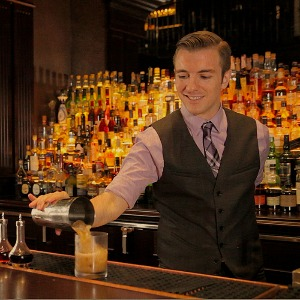 SS: Classic cocktails, like Manhattans, are definitely an iconic part of pre-dining culture. Are you leaning on Amaro Montenegro for your original creations and the classics where amaro is called for in the recipe? CL: This is the great thing – Amaro Montenegro works in both. The fact is that people want original cocktails and bartenders want to make them. Classics are delicious, but people always like to try new things. In the cannon of classic cocktails the basic combinations have already been explored – some sort of acid, spirit, and sweetener shaken or spirits, vermouth and stirred. So, one way to make a new drink is to make a syrup or infusion out of something unusual – like a hops syrup, or chamomile. But with these you may have problems with consistency, keeping it fresh, and inventory. Another way to get at it is to accent your cocktail with an amaro that already has the flavor built in. You get a little sweetness to round out and balance the drink and it’s an easy thing to reach for when you want to put a finishing touch on an original drink. SS: So, no matter how you slice it, bartenders can count on Amaro Montenegro? SS: Time doesn’t lie, does it? CL: No, it doesn’t. A lot of people are under the impression that cocktails are a new thing. It’s because of the boom of cocktail bars we’ve seen in the last 10-15 years. What they may not understand is that cocktails are the original American contribution to the global culinary scene. Americans created cocktails. We invented the Mint Julep and the Old Fashioned, but before those inventions people would have thought you were crazy to mix mint and bourbon and sugar. We’re continuing this heritage of creation, of innovation and at the same time we’re seeing this wonderful resurgence of a culture that understands it is okay to have some amaro before or after a meal, enjoy a cocktail after your workday and have a responsible evening and still have a good day the next day. Healthy drinking culture has been demonized and sent off track in the 1920s and it has taken us all this time to understand flavors are delicious and we don’t have to drink thoughtless drinks. We can spend our time and energy and buy something like Amaro Montenegro and sip it and talk and have this wonderful experience with our friends and family. SS: When you and your bartender family talk about reimagining classic cocktail recipes what ingredient or sorts of ingredients (e.g. Vermouth, etc.) often get replaced by Amaro Montenegro? CL: Amaro Montenegro brings everything to the party. It brings delicious flavors of bitter cherry, orange, and cucumber. You get bitterness, sweetness, complexity, and a ton of delicious citrus. That means that Amaro Montenegro can take the place of vermouth, sugar, spirit, sherry, you name it. It’s just so versatile. SS: Versatility is exciting, but are there specific cocktails you can think of where swapping in Amaro Montenegro is a great idea? CL: Amaro Montenegro is complex and wonderfully aromatic. I think it works best in place of vermouths, especially in stirred cocktails. For classics, I especially love it with American whiskey. It makes a killer Manhattan. SS: Rumor has it that bartenders everywhere are playing with their Negronis. What is it about this particular drink that makes it ripe for Amaro Montenegro replacement? CL: At its most basic level, a Negroni is just gin, fortified wine, and bitter liqueur. Substitute one gin for another, or one fortified wine for another, and you have a radically different drink. Amaro Montenegro is soft and approachable, and has a citrusy, vegetal quality that blends seamlessly into gin. Put all three together, and you have a real crowd pleaser. SS: You’ve been pleasing the crowds swarming the bar at The Nomad with your drink The Black Spot. Tell us about your inspiration for this recipe. CL: The Black Spot is a variation of the classic cocktail Corn & Oil. I wrote this drink while tasting Amaro Montenegro and realizing how well its citrus flavors cut through and balanced the molasses flavors of blackstrap rum. I put two together with Falernum and limes, and the result was just amazing. SS: That drink sounds amazing! No wonder it is keeping guests ordering more. But how is it for your bottom line? CL: Amaro Montenegro can be a simple cocktail by itself or an ingredient. Either way, you have a responsibility to your guests and to your bar. For me, as I manage a high volume bar like The Nomad, having a bottle of Amaro Montenegro is very convenient. We make a lot of cocktails and instead of trying to make a house-made ingredient for each of them it’s better and more consistent and more responsible to use a product like Amaro Montenegro to pull out that flavor. You can spend a lot of time and money doing R&D for syrups and infusions that may or may not work or you may not be able to make consistently. It’s more responsible to the bar to use the amaro because you aren’t spending money on the R&D and you don’t have to pay someone coming in to make the syrups. And your guests know that the drink will taste the same every time they come in to get it. So, you kind of win twice. SS: Is there anything else you'd like to share about winning with Amaro Montenegro and how it plays so nicely in classic cocktails with a twist (twist as in unique spin, not citrus peel)? CL: Amaro Montenegro is like the gateway drug for complex cocktails. It is soft, approachable, and delicious, and gives you a whole bouquet of delicious flavors to work with. Because it’s so versatile, anyone bartending at home can just substitute it for one ingredient or another and reinvent delicious classics. Experimenting your friends is so much fun, and everyone wins with delicious drinks.